Dell Latitude E6520 Laptop,i5@2.5ghz,4gb Ram,250gb Hdd,win 10, builtin webcam, dvd rw,hdmi,card reader,WiFi. Used but in good condition and in full working order, comes complete with charger and battery life is good,it’s been upgraded to the very latest windows 10 and is activated, ready for a new user, it’s powerful and reliable, ideal for home or work use, the item in the picture is the item you will receive, uk buyers only, check out my other great items, thanks for looking. Dell Latitude D630 Laptop. Hard Drive: 80GB HDD. Integrated Wifi: Yes. Optical Drive: CD/CDRW/DVD /-RW Drive. Physical Condition: Second user condition. Ready to use straight out of the box. Open Office, Windows Defender Anti-Virus, Foxit Reader and iTunes. WIFI Internet Connectivity. This is an ex corporate Laptop which been re tested and reinstalled by our highly trained staff. All our computers been tested for at least 24 hours run test and sold on tested working basis. Dell Latitude E6400 Laptop. Hard Drive: 250GB HDD. Integrated Wifi: Yes. Genuine Windows 10 Pro Installed. 100% Genuine Microsoft Windows 10 installed with Software Bundle including Open Office, Windows Defender Anti-Virus, Foxit Reader and iTunes. Dell Latitude E7440. Battery Life is Healthy. Headphone/microphone combo jack. HDMI, Mini Display Port. Showing signs of use, the odd mark, scratch, buff to be expected! Adobe Reader- Good For Viewing, Printing, Signing, and Annotating PDFs. 256Gb SSD Hard Drive. It has been fully updated and is in perfect working condition. Windows 10. 1366 x 768 Screen. Core i3 2370m cpu. Dvd re-writer. Model number : Dell Inspiron 15 - 3552. 2 years old Laptop in perfect condition. Hard disk : Seagate 500GB hard drive. System type : 64bit. Est. delivery dateEst. 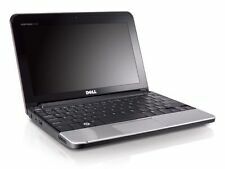 delivery Tue, Apr 23Type: Notebook/LaptopBrand: DellProcessor: Intel Core i3 2nd Gen.
Dell Latitude E7240 12.5" Laptop. Windows 10 Pro Installed. Good refurbished condition, may have minor marks/scratches on lid or small bezel issues. The Delete Button doesn't work other than that it is perfect. - 250GB HDD. This laptop is fast due to the 4GB of RAM and i5 CPU. - Microsoft Office Professional Plus 2016 (worth over £100 alone). - 4GB of Ram. The item may contain very slight marks of usage. New Other Hortonwood 2, Unit 3. Cherwell Enterprise Park. XPO IT Services Ltd. Unwanted Goods. 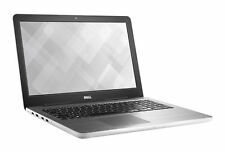 Dell Inspiron 15R 15.6" (Intel Core i7 3537u, AMD Radeon 8750m, 250GB HDD, 8GB). Great laptop, selling due to upgrading. Has dedicated graphics card and i7 intel processor. 4 x usb port, HDMI port, Ethernet port, aux port, disk drive. Has powerful AMD RADEON graphics that runs well with the equally powerful Intel i7 CPU capable of light gaming. See pictures for crack in corner of laptop. Does not effect internals in any way. All functions are working. Includes charger. Hard drive replaced from original with windows 7 installed. Hard Disk Drive Size: 320GB. Genuine Windows 7 Professional. 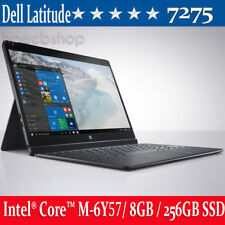 Latitude, 6430U. 120 GB SSD. 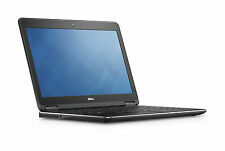 Dell Latitude E6230 | SUPER FAST | i7.2.90 GHZ-3520M | 8GB RAM | 128GB SSD.12.1" (#122737473873) £199.99 View Item. EXCELLENT PERFORMANCE,WITH WINDOWS 10 PRO,64 bit. HP DESKTOP ELITE i5. Dell Inspiron 7559 Laptop. Condition is Used. Dispatched with eBay delivery - Shutl 1 day. No scratches, dents or any other damage to the laptop. Reset to factory settings - will be like new. Bonus HDMI cable included (can be used to connect laptop to a larger screen e.g. TV, or to connect a games console to the laptop). Dell are famous for their large range of top quality products and have over 30 years of experience in the tech industry. Dell laptops and netbooks utilise the company’s expertise in the area of computing and have a product range to suit almost any type of user. 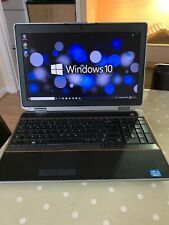 Whether you are after a new, refurbished or used Dell Laptop or Netbook you will certainly find a great range on eBay. The Inspiron range is designed for everyday use at home and in the office, with the 5000 Series being the middle range. The Dell Inspiron 15 5000 features an 13-7100U processor with 2.40GHz, allowing you to easily switch from one programme to another. The 4GB computer memory ensures a strong performance, whilst the 1TB of harddrive space lets you keep all of your important files and apps to hand. With a 1366x768 resolution, the 15.6 inch backlit screen outputs great visuals. High performance Dell computers include the top of the range XPS 13 laptop. Self proclaimed as “the smallest 13.3 inch laptop on the planet”, the InfinityEdge screen is nearly borderless, maximising screen space. A 7th Gen Intel Core 15 processor, with up to 3.1GHz, keeps this Dell laptop running quickly and smoothly. The 8GB of RAM ensures that the system can handle whatever you throw at it, whilst the 256GB of SSD space lets you pack your machine full of useful documents and programmes. Dell Alienware laptops are an essential piece of kit for those who need responsive gaming. The pink and black design adds a touch of style, whilst the Alienware TactX keyboard ensures you make the most of every keystroke. The Intel Core 15 processor can reach up to an impressive 3.5GHz with Intel Turbo Boost, giving you a competitive edge. Designed with anti-glare technology, the 13.3 inch 1366x768 HD display is complemented by the graphics card. The NVIDIA Geforce TX 1050 displays an amazing range of colours, shows the smallest of details and can handle anything you throw at it.